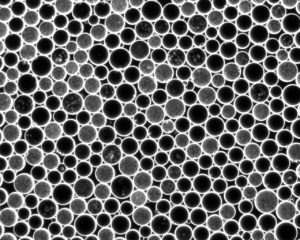 Growing bacteria in picoliter droplets. 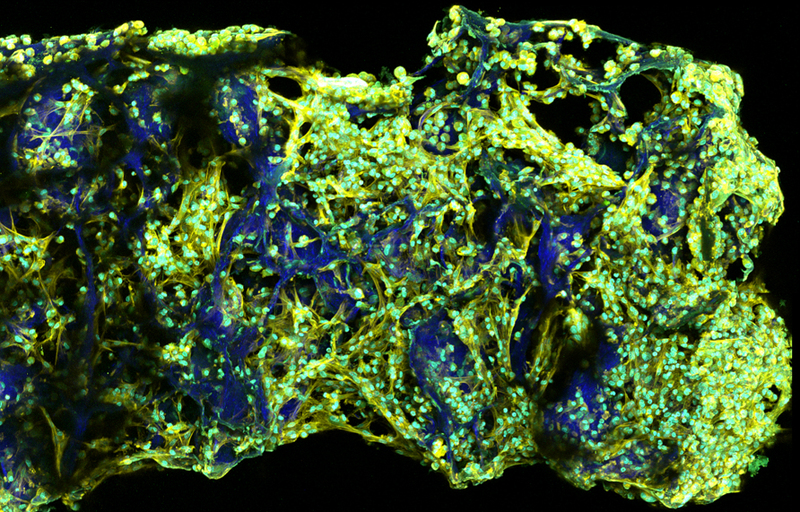 Cross-sectional view of a scaffold seeded with mouse bone marrow stromal cells. Maximum intensity z-projection of a 100 micron stack acquired by 2-photon microscopy. What is the detailed progression of bone repair in a scaffold based system? How do host and donor cells interact with a biomaterial to form new tissue? What is the ideal proto-tissue prior to implantation? What is the ideal scaffold design for bone tissue engineering? Towards addressing these questions, I: (1) design and test scaffolds for delivering cells to an injury site and provide a bridge between undamaged host tissue, and (2) use 2-photon live animal imaging to gain insight into the cellular dynamics of the repair. FIG. 1| Electron micrograph of scaffolds for bone regeneration. Scaffolds are used deliver cells to a site of injury and to provide a pathway for migration of host and donor cells. 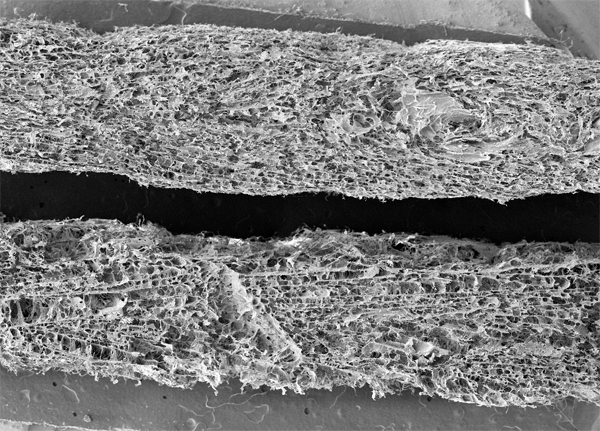 This particular scaffold is primarily made of type-I collagen fibers. FIG. 2| Visualizing cells in a live animal. 2D (left) and 3D (right) 2-photon acquired images showing osteoblast cells (bone makers, GREEN) and the surrounding collagen matrix (BLUE). This image was taken in a mouse skull. 2-photon microscopy allows our team to visualize cells in living tissue. Stem cell fate depends on physical and chemical cues in the cell microenvironment; which can be more accurately controlled within a perfused microfluidic system. I developed a novel microculture system for murine embryonic stem cells, the volume of which is about 6 microliters. Furthermore, I outlined the optimal nutrient perfusion conditions and seeding density for self renewal of primary mouse embryonic stem cells cultured in the device. This work provides a practical description of the fabrication and use of a microculture system that provides increased control of the stem cell microenvironment. Villa, M.M. et al., Biomed Microdevices 12, 253, 2010. 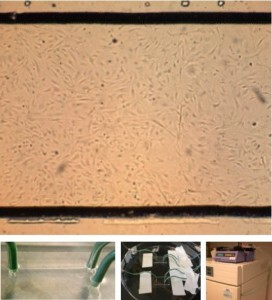 Top row: Primary mouse fibroblasts cultured in the system during development. Bottom row L to R: Close up of the microsystem, 2 microsystems hooked up to a syringe pump, and syringe pump providing perfusion for microsystems within a cell culture incubator.